___ The girls take this in stride. After all, they’re learning two versions of most words. ___ But animal noises — or, rather, the sounds we humans make or write to depict animal noises — are different from most words. Rather than naming an object, such as “dog,” or action, such as “bark,” they are supposed to represent the actual sound an animal makes: “Woof.” That’s called onomatopoeia, which Jean-Jacques Rousseau and other thinkers posited was the origin of human language. That idea, which has since been widely dismissed, is now derisively known as the bow-wow theory. ___ But why aren’t animal sounds the same across languages? But for a few exceptions tenuously identified by scientists, animals speak the same language all around the globe. 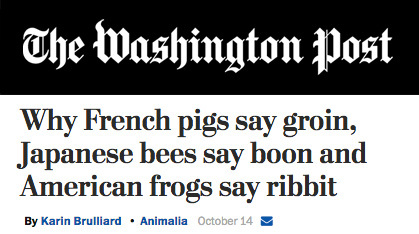 Shouldn’t the way we make their sounds be the same, too? ___ Another sweet one is Bzzzpeek, a site that features recordings of native speakers of several languages, mostly children, doing their sounds of animals and vehicles. Take a spin through it and you’ll find that there’s fairly widespread agreement about cats’ “meow” sound, though not in Japanese (their kitties say “nya-nya”). A horse in Lithuanian sounds downright weird to my American ear: Something like “yii-gaga.” A lion’s roar in Polish is familiar, not to mention quite frightening. ___ Derek Abbott, a physicist and electronic engineer at the University of Adelaide in Australia, has compiled one of the largest collections of animal sounds, which he’s put together in a table that you can see here. As might be obvious from Abbott’s specializations, this is a side project for him. He said in an email that he’s gathered them by asking scientists “during coffee breaks” at international conferences what words are written in their languages in cartoon bubbles or children’s books to express an animal sound. ___ Ahn said he regularly discusses animal sounds in introductory linguistics classes “because they reveal some really interesting things about human language.” One is what’s known as “arbitrariness,” or the idea that many word sounds have nothing to do with with the concepts they describe — they’re just random. Onomatopoeic words, of course, are not random, but they have some arbitrariness, Ahn said. For example, studies that have measured the frequency of bee wings make show they don’t make a “Z” sound, but many languages approximate the sound with a “Z” anyway. ___ The written hissing sound of a snake, Abbott has found, is pretty similar across 15 languages. A wolf’s mournful howl — “oou” in Dutch and “huu” in Italian — is also fairly uniform. But his table also reveals some surprises. ___ “A scientific question that needs to be answered is: Are the Japanese hearing a ‘Z’-like sound in the first place but have no interpretation, or are they actually hearing the ‘Z’ differently in the first place due to their conditioning?” Abbott said. ___ In at least one case, geography has played a role. Only American frogs are said to go “ribbit,” and that’s believed to be because early Hollywood producers used the ribbiting sound of the Pacific tree frog during night scenes. ___ There are, of course, thousands of languages in the world, and Abbott’s table — which, again, has been limited by the population at scientific conference coffee breaks — doesn’t include those from other places where many camels live, such as the Horn of Africa, nor does it include the widely spoken Arabic or Chinese. ___ The Turks, in my opinion, do the rooster best. You can hear their solid rendition, “ü-ürü-üüü,” on the GoCompare interactive above. ___ By the way, no one, as far as I could find, has yet figured out what the fox says. ___ As for the cow? My 14-month-old is regularly told that it says “moo” or “meuh.” But when I ask her what a cow says, she says without fail: “Brrr.” And who knows? Maybe she’s right.